At Carnegie Hall on Wednesday night, the Mariinsky Orchestra and pianist Daniil Trifonov offered the New York premiere of the artist's first Concerto for Piano and Orchestra. Now 26, Trifonov has made a name for himself as a young and respected virtuoso, the leading example of a new generation of piano-slingers thrilling listeners around the world. This concerto, which received its New York premiere at this concert, is his shot at a whole new kind of legitimacy. From the opening orchestral figures, this is music that looks stoically toward the past, that past being 19th century Russian romanticism. The long opening movement adapts the idea of incorporating the solo artist into the orchestra as well as allowing flights of prestidigitation up and down the keyboard. The cadenzas were impressive, requiring dexterity, speed and power and the orchestra returned obediently at the recapitulation, stating the opening theme in an even more florid manner. The soloist moves further to the fore in the slow movement, a bridge between the work's two big outer "wings." Lyricism and a songfulness endemic to Russian music predominated here. The finale was pure guts, with Trifonov's monster technique coming to the fore, indulging himself in lightning arpeggios, pounding chords and maintaining an ever-flowing forward momentum as the notes poured forth. While his pianism was pristine, the missing ingredient here was a sense of adventure and excitement, of pushing boundaries for both the artist and the listener. This work may prove popular with listeners and it is a perfectly crafted example of a neo-romantic piano concerto. However, with so much literature in this genre, this work stubbornly refused to tread new ground. It may not have been the best idea for music director Valery Gergiev to open the evening with Don Juan, the Richard Strauss tone poem that established that composer as a striking voice of originality at the end of the 19th century. 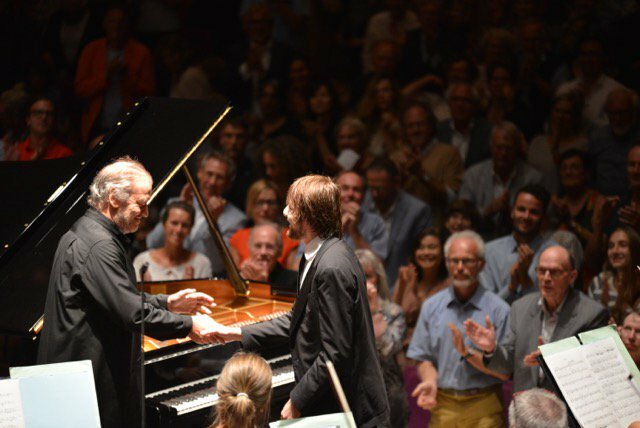 Perhaps it is his recent tenure conducting in Munich that is at play here, but Gergiev sounded relaxed and confident, offering a breezy reading of the Strauss score that still tugged the heart at the work's big emotional climax. The brass playing was superb. The spirit of innovation also burned bright in the second half of the program. Prokofiev's Symphony No. 6 has barely scrabbled into the repertory. Written in 1947, a period when the Soviet Union was more interested in empty celebrations of so-called Socialist Realism, it is a sardonic and dark work that casts a withering eye on Russian patriotism and the celebration of the country's victory in World War II. Gergiev and his forces led a powerful and inspired performance of this work, contrasting nimbly between chirping folk-like woodwinds and iron-fisted brass chords that slammed into the fabric of the orchestra with the force of an Olympic hammer-thrower. The three movements each packed considerable punch, with the finale ending on a note of questioning terror and despair. As if to salve the audience, the Mariinsky players gave one of their best encores: the Lullaby and Final Scene from Stravinsky's Firebird. In this encore one finally felt uplifted, transported and inspired. (Reprinted courtesy Superconductor).